A bicycle maker who was well known for his 6 Day Racing machines. He made bikes under a number of brand names, including his own. 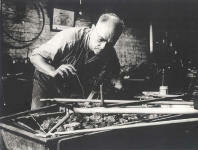 "I am an old bicycle rider and have built hundreds of bicycles for the Otto C. Ling Co. of New York City. (They are out of business now as both Mr. Ling and his son are dead.) 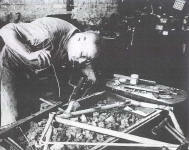 "
Marvelous photos taken as Alvin Drysdale hearth brazes a very large frame. Taken by Marvin Winter of New York City. Pics taken while he was there getting a custom frame built; approx. 1960! 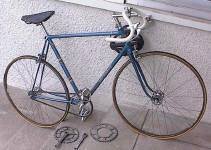 Blue road bike from 1940s~50s? Joe Bender-Zanoni's Nervex lugged road bike.